Ougri-2019: Drift into Utopia. . . .
International Day of Yoga - IDY 2018. Revised guidelines of Central Sector Interest Subsidy Scheme (CSIS), 2009. Shortlisted candidates for written and interview of PhD Examination (2019 - session) of Mechanical Engineering. Shortlisted candidates for PhD January session 2019. Admission to PhD Programme in January 2019. Registration for Continuing MSc/PhD students. Five Day Workshop on "Recent Trends in Biological Inorganic Chemistry" from 22nd to 26th April 2019.
click here for invitation of sealed rate quotation for printing and supply of Answer sheets at NIT Manipur. Advertisement Letter under Technical Education Quality Improvement Program Phase - III for Consultancy services for Minor civil work for Mechanical Department. Notice Inviting Tedner document for Extension of Mechanical Workshop (Phase-1) at NIT Manipur Langol Campus. Shortlisted candidates for interview with reference to the advertisement no. NITM.1/(223-Estt)/SERB/EXTRA MURAL/2017/2. Office order for appointment of Registrar-in-Charge of NIT Manipur. Cancellation of Notification regarding recruitment of non-teaching post(s) at NIT Manipur. Office Order for Submission of Annual Performance Appraisal Report for the period 01.04.2018 to 31.03.2019 to their respective Reporting Officer. The following candidates are shortlisted for interview for JRF in the BRNS sponsored project entitled "Iron-carboxylate complexes as the cancer-specific metallo-prodrug" against the advertisement no. NITM.1/(233-Estt)/BRNS/MithunRoy/2017(Pt)/1187, dated 21.02.2019. One week training programme on, "VLSI Design Flow using Cadence Suite", from 25th- 29th March 2019 at NIT Manipur. In continuation of this office advertisement No. NITM.1/(2a-Estt)MP/REG/2019/1149 dated 06.02.2019 for appointment of faculty positions in NIT Manipur, it is notified for public information that the last date of submission of application form for the post of Professor and Associate Professor is extended till 5:00 P.M. of 11th March, 2019 (Monday). No, extension is made for the post of Assistant Professor. Click here for recruitment of JRF under EMR-SERB project title "Improvising the stability and capacity of spinel ferrites for Li batteries" in Physics at NIT Manipur. In continuation of this office advertisement No. NITM.1/(2c-Estt)/MP/R-N/2017(Pf)/1040 dated 11.01.2019 for appointment of Registrar at NIT Manipur, it is notified for public information that the last date of submission of application form is extended till 5:00 P.M. of 25th February, 2019 (Monday). National Institutional Ranking Framework data for NIT Manipur for the year 2019. Employment Notification for recruitment of Faculty Positions at NIT Manipur on regular basis. It is hereby notified to all regular faculty, trainee teachers and non-teaching staff of the institute to furnish their immovable property returns (IPR) for the year 2018 in the specific format (uploaded in institute website, Essential Info section) completed in all respect to the Registrar on or before 31st January 2019. Click here for Hostel Rules and Regulations. Circular regarding Submission of Immovable Property Return by the teaching and non-teaching regular staff of NIT Manipur. * Download IPR Form format. All regular Teaching staff of the Institute are informed to submit their Annual Appraisal Report (APAR) to their respective reporting officers. * click here for Office Order. * click here to download faculty APAR in pdf format. * click here to download faculty APAR in word format. 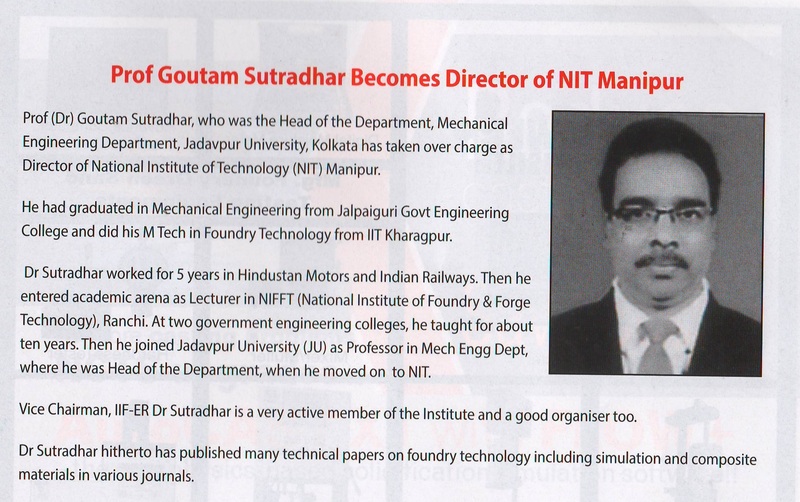 Corrigendum to NIT Manipur TEQIP-III advertisement no. TEQIP-III/2019/nitmn/Shopping/87 Sl.no. 2 dated 21.02.2019 for supply of civil lab equipment at NIT Manipur. Protable Arsenic Anayzer and Ion chromatography. Enquiry for supply of Computer Workstation for DST Inspire project at the Department of Chemistry, NIT Manipur. Enquiry for supply of DTH - Direct to home (set-top box) with LED TVs at NIT Manipur for SWAYAM PRABHA under TEQIP programme. Corrigendum to NIT Manipur TEQIP-III advertisement no. TEQIP-III/2019/nitm/Shopping/91 dated 22-02-2019 for the invitation of quotation for Workstation at NIT Manipur. click here for Tender document for catering services at Boys Hostel no-2 Langol campus, NIT Manipur. click here for Invitation for Quotation for supply of Goods for Electrical Engineering Dept. under TEQIP-III. click here for Invitation for Supply of DS controller Borad at NIT Manipur under TEQIP-III program. Corrigendum to NIT Manipur TEQIP-III advertisement no. TEQIP-III/2019/nitm/Shopping/43 dated 16.01.2019 for supply of Nanofiber Electrospining unit at NIT manipur and another advertisement no. TEQIP_III/2019/nitm/Shopping/47 dated 22.01.2019 for supply of D33 Peizoelectric at NIT Manipur is hereby notified for information to all prospective/potential bidders that the last date of submission of Quotation is extended upto 28.03.2019. Other terms and conditions of the tender document will remain unaltered. click here for Invitation for Quotations for supply of Computer Workstation. click here for Invitation for Quotations for supply of Magnetic Induction Heating systems. click for Corrigendum to tender no TEQIP-III/2019/nitmn/Shopping/79 dated 18.02.2019 for the supply of Civil Lab Equipments at NIT Manipur. Annexures for: 1. Mechanical Lab. click here for Invitation for quotation for supply and installation of Basic Interactive smart classroom at NIT Manipur under TEQIP-III. Technical Specification for basic smart classroom. Click here for Invitation for quotation for supply and installation of Advanced smart classroom at NIT Manipur under TEQIP-III. Technical Specification for Advanced smart classroom. Recruitment of Registrar at NIT Manipur. Recruitment of Assistant Registar at NIT Manipur. In continuation of this notification of even number dated 24th October 2018 for regular appointment of Non-Teaching Posts at NIT Manipur, it is notified for public information that the last date of submission of application form is extended till 4:00 pm of 12th December 2018. Employment Notification for recruitment of Non-Teaching Post at NIT Manipur on regular basis. Recruitment Rules for Non Teaching Staff. Click here for recruitment of Project Assistant under DST-INSPIRE project in Physics department at NIT Manipur. 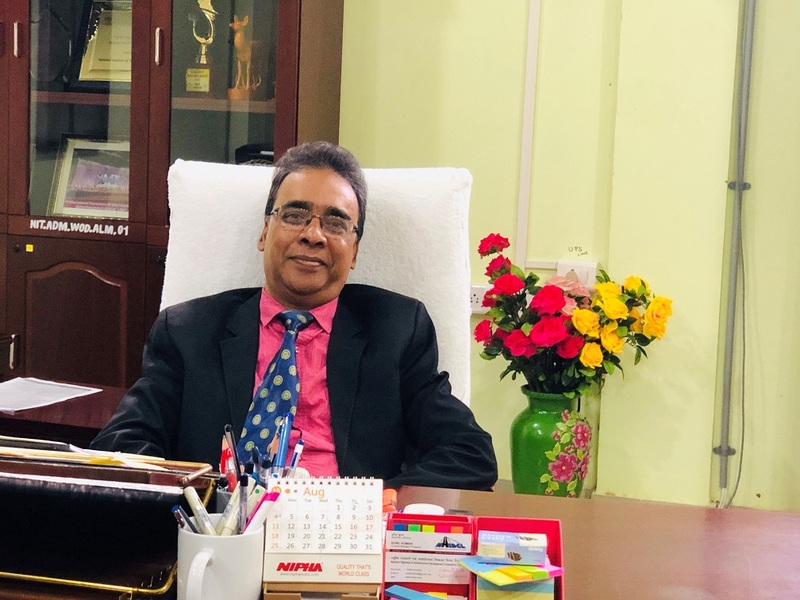 National Institute of Technology Manipur, a centrally funded institution is set up to impart quality technical education to various levels of higher learning. It is one of the ten newly set up NIT's by the Ministry of Human Resource Development, Govt. of India vide its order no. F.23-13-2009-TS-III dated 30th October 2009 and 3rd March 2010. It has been established to cater to the needs of the thousands of students from the North East and outside in the field of Technical Education With National Institute of Technology Agartala, as its mentor institute and tremendous support from the State Govt. of Manipur, NIT Manipur started its first session on 1st August, 2010. The Institute was first established under the Manipur Societies Registration Act, 1989. (Regd. No. 425/M/SR/2010). Later, NIT Manipur was declared as a full-fledged NIT along with nine other new NITs,through An Act of Parliament and notified under Govt. of India Gazette notification No. 28 0f 2012 dated 7th June 2012 and declared as an Institute of National Importance. The Central Library NIT Manipur, is one of the important central facilities of the Institute and has two sections - one in permanent campus Langol and secondly in temporary campus, Takyel. The placement office handles all aspects of campus placements for the graduating students at NIT Manipur. The office is well equipped with excellent infra-structure to support every stage of the placement process. Arrangement for Pre-Placement Talks, Interviews, Group Discussions etc. click here for "A Six Day workshop on Faculty Development Programme 12th to 17th March 2019 under TEQIP-III programme". Two Day workshop on Application of Field Programmable Analog Array (FPAA) in VLSI at NIT Manipur from 8th - 9th April 2019.